TV show dates: March 7, 2018 — June 15, 2018. Performers include: Lucy Hale, Dylan Walsh, Gillian Vigman, Brooke Lyons, Carlos PenaVega, Jayson Blair, Elliot Knight, Dominique Lucky Martell, Riley Smith, Shannon Chan-Kent, Nadej K Bailey, and Claudia Rocafort. A comedy-drama from creators Erin Cardillo and Richard Keith, the Life Sentence TV show centers on Stella Abbott (Hale). After a lethal cancer diagnosis, Stella spent eight years living her life like any dying young woman might. She did things like face her fears, travel the world, and even married a stranger on a whim. Once Stella learns she’s been unexpectedly cured, she must start facing the long-term results of her decision to live like there was no tomorrow. In the wake of her good news, Stella learns about a lot of bad news people had been keeping from her. When they expected her to die, Stella’s family did their best not to burden her with their problems. Now that they’ve removed the kid gloves, she’s shocked to find out her parents Peter (Walsh) and Ida (Vigman) are no longer in love with one another. Stella has to deal with the knowledge that decisions her father made — like spending their retirement to help Stella live it up — contributed to the breakdown of her parents’ marriage. On top of that, her mom, Ida, has fallen in love with Stella’s godmother, Poppy (Rocafort). What’s more, Stella’s sister, Elizabeth (Lyons), gave up on her own aspirations in order to please her parents by having children with her husband, Diego (PenaVega), as well as to help with Stella’s care. Meanwhile, their slacker brother, Aiden (Blair) has been using his sister’s diagnosis to get pity dates from women. When Stella married Wes (Knight), she only expected to live six to eight months. Now that “’til death do us part” could happen much later than sooner, the good looking Londoner isn’t sure he can maintain his perfect husband facade. As reality sinks in, Stella realizes she must stop living like she’s dying and start living like someone with a whole life ahead of her. As she does so, she also must help her loved ones do the same. After Stella (Lucy Hale) puts her and Wes’s (Elliot Knight) life on social media, they find themselves defending their relationship to the world and forcing them to question what the future holds for them. Peter’s (Dylan Walsh) health scare makes him realize who he really wants to be with. Meanwhile, Aiden (Jayson Blair) doesn’t want to give up on his dream of the bar and clamors to find a solution. What do you think? Do you like the Life Sentence TV series? Should this TV show have been cancelled or renewed for season two on The CW? Please renew. Such a great show, I’m sad. Love Lucy Hales character and her fun wardrobe. Please bring back! 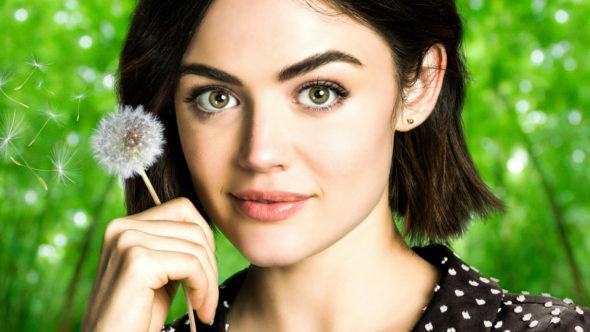 I WANT LIFE SENTENCE TO COME BACK!!!! ITS SUCH A BEAUTIFUL AND POIGNANT SERIAL. WHY WOULD ANYONE CANCEL IT?! THIS IS SO WRONG. IM SO INVOLVED WITH THIS SERIES. I HOPE IT COMES BACK. PLS DO SOMETHING SO IT COMES BACK! SECOND AND THIRD SEASON PLEASE! Just binged on Netflix. Bummed it has been cancelled. I really wanted to see what happens next. Great show! So sad it is cancelled. Wonderful writing, great messages of family togetherness, and great story of hope; all things you don’t see on TV anymore. I am in hopes that another network will pick this show up. Netflix? CMT? CW seems to only want vampire drama or comic book TV. No thanks! great show please keep it.